Samuel Cohn is Professor of Medieval History at the University of Glasgow, where his interests include the history of medicine and histories of popular protest in medieval and early modern Europe. He is the author of eleven monographs, most recently Popular Protest in Late Medieval English Towns (CUP, 2013) and Cultures of Plague: Medical Thinking at the End of the Renaissance (OUP, 2010). He is currently working on a Major Research Fellowship from the Leverhulme Trust to complete a project on ‘Epidemics: Waves of disease, waves of hate, from the Plague of Athens to AIDS’. In this blog post he discusses that project and the research he has been conducting recently. A scholarly consensus persists: across time, from the Plague of Athens to AIDS to the present, epidemics provoke hate and blame of the ‘other’. 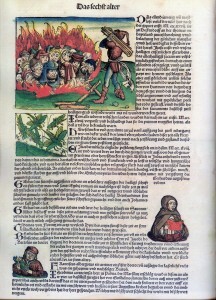 As early as the late Enlightenment, the Danish-German statesman and scholar of antiquity Barthold Georg Niebuhr (1816) proclaimed: ‘Times of plague are always those in which the bestial and diabolical side of human nature gains the upper hand.’  In a famous article in Annales (1952), René Baehrel reasoned: epidemics induce ‘class hatred (La haine de classe)’; such emotions have been and are a part of our ‘structures mentales… constantes psychologiques’. With the rise of AIDS in the 1980s and 1990s, this chorus resounded. According to Carlo Ginzburg, ‘the prodigious trauma of great pestilences intensified the search for a scapegoat on which fears, hatreds and tension…could be discharged’. Dorothy Nelkin and Sander Gilman claimed, ‘Blaming has always been a means to make mysterious and devastating diseases comprehensible’. Roy Porter concurred with Susan Sontag: ‘deadly diseases’ especially when ‘there is no cure to hand’ and the ‘aetiology… is obscure…spawn sinister connotations’. And most recently, from earthquake wrecked, cholera-hit Haiti, Paul Farmer concluded: ‘Blame was, after all, a calling card of all transnational epidemics.’ Many other scholars and public intellectuals can easily be added to this consensus. 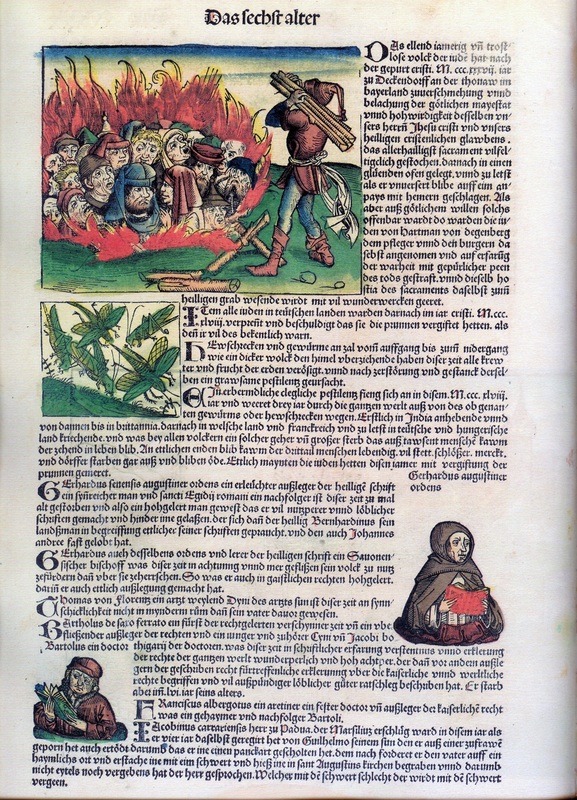 The problem is: these pronouncements have been based on few examples—sometimes, the Black Death and the burning of the Jews, 1348-51; sometimes, the rise of Malfrancese (or Syphilis) at the end of the fifteenth century; sometimes, a handful of cholera riots of the nineteenth century; and AIDS in the 1980s (but based almost entirely on the U.S. experience). For several years I have been engaged in a study of the socio-psychological reactions to epidemic diseases that cuts across the canonical periods of history—Antiquity, Middle Ages, Early Modernity, and Contemporary History. From a wide range of sources, I have been collecting thousands of descriptions of epidemics as early as the ‘great pestilence’ during the First Dynasty of Pharaoh Mempses, c. 2920 BCE. Against the grain of the historiography, I am finding that few epidemics spurred hatred against the ‘other’ or indeed against any insiders. Instead, before the nineteenth century and the ‘laboratory revolution’ of the 1870s, when epidemic diseases rarely, if ever, had effective cures and most were medically mysterious, my research reveals the opposite: such outbreaks tended to dissolve class conflicts (at least for the course of the epidemic) and to elicit compassion and self-sacrifice. What about the Black Death? Indeed, the Black Death of 1347-51 was the striking exception, not only for the Middle Ages, but for any epidemic or pandemic across time and space. But with numerous successive waves of plague during the later Middle Ages and Renaissance, its mass terror against Jews or against any other minorities was not repeated. However, as early as 1530 and into the seventeenth century, accusations of intentional plague spreading (‘engraisseurs’ in France; ‘untori’ in Italy) emerged, even if the numbers accused or executed never approached those of 1348-51. This early modern rise in accusations, trials, and execution of supposed plague-spreaders was not the result of ‘ideas and fantasies’ tumbling forth from isolated alpine foyers as Yves-Marie Bercé once alleged. Not only did such accusations arise in cities near the Alps as with Geneva, Lyon, and Milan, they spread with early modern plague in Toulouse, Rouen, Palermo, Messina, Madrid, Rome, and other places awaiting to be studied. More importantly, their impulse had nothing to do with imported ideas or individuals from backward places outside cities. Instead, with the backing of physicians, university-educated judges compiled and authorized the accusations, imposed the tortures, and executed the victims. During Milan’s plague of 1630, where trial transcripts survive, one of Europe’s most advanced health boards, steeped in the latest scientific knowledge about plague contagion and its mechanisms of transmission, gave ‘scientific’ credence to the allegations and supported the executions. In addition, the accused were not ‘outsiders’ but ‘insiders’, beginning with solid native-born skilled artisans and ending with young bankers and even the son of one of the most important military leaders of the city. With the spread of cholera across great swaths of Europe from 1830 to 1837, epidemics’ social toxins became more widespread and virulent. This explosion of hate and blame, however, did not in the main target any ‘other’. Rather, it was a class struggle, whose arrows of hate shot in the opposite direction. Across radically different social and political regimes from Czarist Russia to Liberal Manchester, impoverished and marginal groups such as Asiatic Sarts, newly arrived in cities and villages of the Crimea, and Irish Catholic immigrants in Glasgow, Edinburgh, Liverpool, London, and New York imagined the state allied with physicians and health workers concocting a new disease to cull the poor and thereby lower the state’s welfare expenditures. In riots often numbering in the thousands, the targets of these labourers and others living on the margins were physicians, nurses, pharmacists and public officials from the police to regional governors, with cholera hearses, hospitals, and town halls ritualistically broken to bits or burnt to the ground. These riots were not exclusive to the cholera’s first major European tour of the 1830s, when the disease was new and mysterious. In Italy they persisted to the sixth cholera wave in 1910-11, long after its pathogenic agent and preventive measures had been discovered. Moreover, in later waves of cholera, the Italian riots were no longer confined mostly to Sicily as in 1836. They, instead, fanned across southern Italy and reached places north of Rome such as Segni and Civitavecchia, spread into Tuscany and as far north as Piedmont. With these, the same mythologies as seventy-five years earlier of doctors poisoning the poor fuelled these riots of Italy’s last major cholera wave. In Russian history such riots endured even longer, well into the Soviet period, and in Latin America, they surfaced during the seventh wave in the 1990s. Did other epidemic diseases exhibit such disastrous social toxins? Cholera was not the only disease to spawn hate and violence into the twentieth century, even after their pathogens, modes of transmission, and effective preventive measures had been discovered. For the United States smallpox was its disease par excellence of hate, and its social toxins burst forth not when the disease was scoring its greatest moralities as during the colonial period or with an epidemic of the early 1850s that spread across the United States and killed a third of Hawaii’s population. Instead, numerous riots and acts of violence exploded with this disease in epidemic waves from the 1870s into the first decade of the twentieth century, that is, at the very moment of the laboratory revolution’s scientific breakthroughs. Again, suspicion and hate spread along class lines, but now hate’s class nature switched directions. Property holders from farmers to merchants comprised ‘the mobs’, while the victims were among the marginal—‘tramps’, ‘negroes’, Bohemians, and the Chinese. Unlike in cholera riots, when the rebels saw themselves as the patients’ liberators, triumphantly processing them from supposed poisonous hospitals back to their homes, with smallpox riots, the disease’s victims were doubly victims, persecuted by elite vigilantes and often shot or burnt alive in makeshift smallpox hospitals. In addition, other epidemic diseases such as modern plague, especially in India and China from 1894 to the 1920s, Poliomyelitis in the United States with epidemics in 1907 and 1916, and typhus in Nazi Germany sparked hatred, blame and violence. In each case the disease’s social toxins possessed their own distinctive traits and targets. So what big epidemic killers in modern times have inspired compassion and self-sacrifice instead of hate and violence? Far from all epidemics of modernity divided populations or sparked blame and hatred. Two of the most deadly yellow fever pandemics to race across southern states in America, with New Orleans at the centre in 1853 and Memphis in 1878-9, brought blacks and whites together in mutual support and respect and saw contributions and volunteers pour in from the north as well as other southern states, creating martyrs to the plague, eulogized in the stricken southern cities’ newspapers and later commemorated with works of poetry, paintings, and sculpture. Despite its monumental mortalities and mysteriousness with its usual symptoms, quickness of death, peculiar age structure of its victims, and extraordinary contagion, the Great Influenza of 1918-19 failed to ignite hatred of victims, doctors, nurses, municipalities or against any other ‘others’. Instead, massive waves of volunteers, especially women, risked, and in many cases lost, their lives to assist and comfort the afflicted. Instead of erecting divisions, this highly contagious, deadly pandemic dissolved divisions as volunteers eagerly crossed state and international borders and broke barriers of class and ethnicity. El Paso, October 1918, is a case in point. Against the rising tide of anti-Mexican sentiment, the growth of the Klu Klux Klan, and nationalist fervour brewed by the Great War, debutants and middle-class girls and ladies ventured into the worst-hit Mexican neighbourhoods to deliver food, sweep floors, clear bed-pans, care for children, and nurse the dying. So why does this study matter? I aim to challenge the one-dimensional and trans-historical consensus that presently dominates the study of epidemic diseases’ social toxins. Even with the growth of epidemics’ hate-nexus in the nineteenth century, some diseases tended to provoke hate and blame, while others beget remarkable acts of compassion. Why has Ebola, for instance, recently provoked violence against clinics and health workers (April to December, 2014)? Was it something to do with Africa as many health workers now believe? Rather, the history of cholera readily demonstrates that such reactions have had a long heritage in Europe, and in places, well into the twentieth century. What characteristics of epidemic diseases are more likely to spark violence and blame? Just as different diseases affect our bodies differently, so too they tend to affect our collective psychologies differently. From this simple axiom, my work intends to open and explore this field of historical psychology with new and systematic research. It is a field that must cross the canonical barriers of historical chronologies and ultimately must become global history. R. Baehrel, ‘La haine de classe en temps d’épidémie’, Annales: E.S.C., 7,3 (1952), 351-360. C. Ginzburg, ‘Deciphering the Sabbath’, in B. Ankarloo and G. Henningsen (eds) Early Modern European Witchcraft: Centres and Peripheries, (Oxford, 1990), 121-138, 124. D. Nelkin and S. L. Gilman, ‘Placing blame for devastating disease’, Social Research, LV (1988), 362-378. R. Porter, ‘The case of consumption’, in J. Bourriau (ed.) Understanding Catastrophe, (Cambridge, 1992), 179-203, 179. P. Farmer with J. S. Mukherjee, Haiti after the Earthquake, (New York, 2011), 191. Y.-M Bercé, ‘Les semeurs de peste’, in Jean-Pierre Bardet and Madeleine Foisil (eds.) La vie, la mort, la foi, le temps: Mélanges offerts à Pierre Chaunu, (Paris, 1993), 85-94. This entry was posted in Uncategorised on 13th September 2015 by Grainne Goodwin.